You know me - always looking for new dinner ideas. Preferably easy ones.....or at least uncomplicated. I don't mind a challenge in the kitchen, but if I'm playing around, I want it at least to come out looking decent and tasting good. 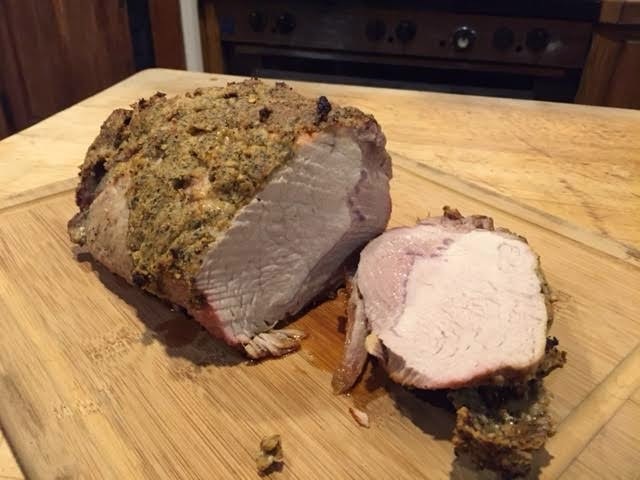 As it goes, it doesn't get much easier than Dijon Pork Loin. Seriously, there are five ingredients. Five!!!! There really isn't a lot to do, though the cooking time is the most cumbersome thing about it. In a small bowl, combine the first four ingredients. 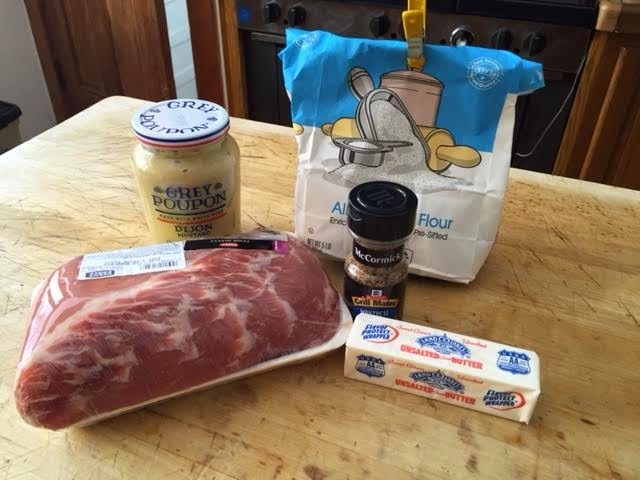 It makes a basically a paste to rub onto the pork loin. I probably used 3.5 T of the steak seasoning and for me, that was plenty. There is a LOT of sodium and red pepper flakes in there, so it does make the soon-to-be crust of the pork a little spicy....and at certain bites, a little salty. I patted dry the pork loin and placed it on a foil covered sheet, pre-heating the oven to 450F. I also (probably) made the mistake of salting and peppering the pork loin liberally. Pork doesn't have a lot of flavour so it needs help. Not really thinking it through with the steak seasoning, it might not have needed additional salt. For 20 minutes, cook the pork at the 450F temp, then reduce the heat to 350F and cook for 50 additional minutes or until the meat registers 150F. Remove from oven, tent with foil, leaving it set for 10-15 minutes. Internal temperature should raise close to 160F. By the way, this could have easily served 4 or maybe 6. We will have pork for the next few days, so I'll have to think of ways to repurpose the loin, as I'm not sure I want it served the same way multiple times. It was a hit with 710. And even Petey got a taste and he seemed happy - though he isn't really the benchmark if it was good, as he'll eat just about anything. let cook for 8-10 hours and it is dee-lish! I love a good pork loin ...and the sammiches it brings in the days that follow ... or the stir fry ... yeah, the stir fry! Sounds delicious! And Bob had some good ideas for the leftovers.